Now I'm not actually much of a chocolate person if I have to choose I always go with Vanilla or other super sugary sweet treats. Not being a chocolate person I had my doubts that I wouldn't really like this product but in the end its incredibly tasty and I was quite surprised by how much I did like it. This melts in your mouth and is really creamy with a smooth milk chocolate flavor. 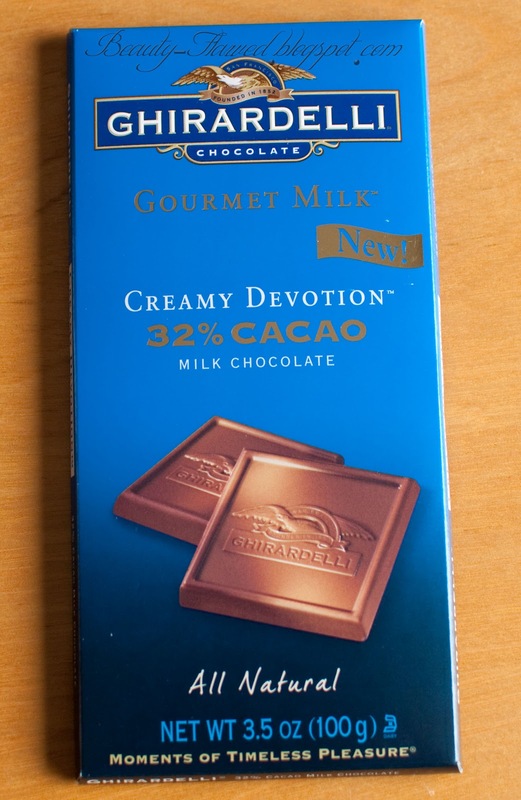 It's nice because the smooth creaminess of this really gives it an edge over other chocolates because the taste really keeps you coming back for more. Calorie wise this isn't too bad either I mean it is Chocolate after all so don't expect this to be calorie free but in moderation this gives you a nice balance. Three squares will run you 200 calories 120 of those being Fat Calories, which honestly isn't too bad because the squares are generously sized and not micro. However if your like me and eat the whole bar in pretty much one sitting... (Okay it was one sitting what can I say I lack self control.) than you might find yourself regretting eating it but that's okay you only live once right? Right now you can print a $1.00 off coupon from the Ghiradelli Website or check out their Facebook Page on Friday for a chance to win one of your very own, the chance to win ends at the end of March I believe tho so be ready to check it out. 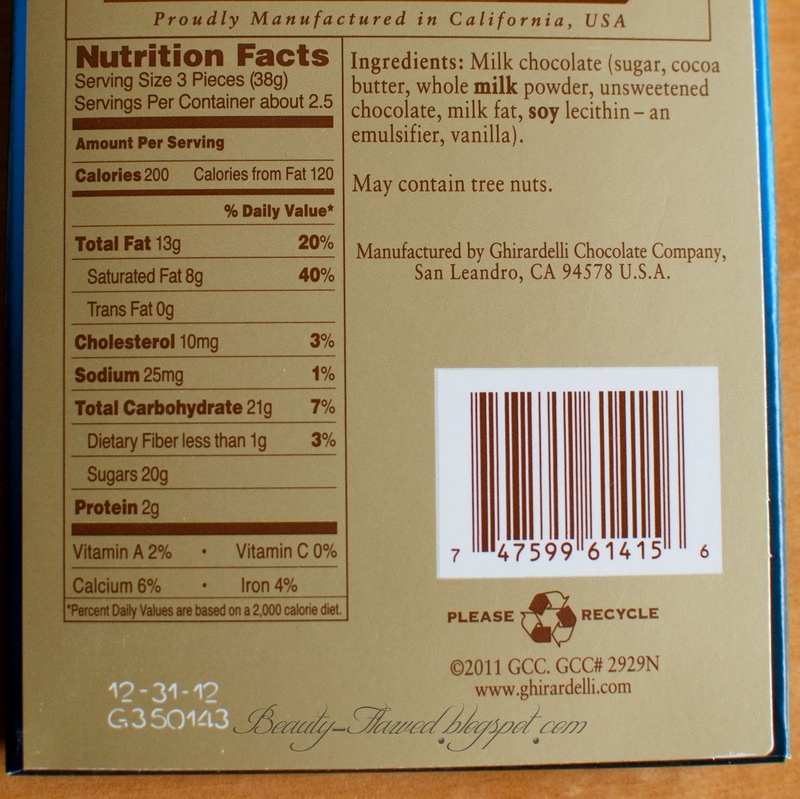 This can be purchased at local retailers such as Target, Safeway, Walmart, Stop and Shop, Ralph's and of course Online directly from Ghiradelli. 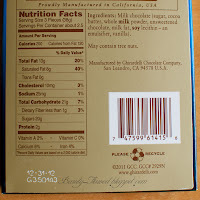 Have you tried any Ghiradelli products, if so whats your take on them? Ingredients: Milk Chocolate (sugar, cocoa butter, whole milk powder, unsweetened chocolate, milk fat, soy lecithin - an emulsifier, vanilla). I am a sucker for chocolate. I have to eat it everyday. Now thanks to you I am so tempted to try this out. lol. yammy, now this looks delicious! I'm a big Dove chocolate fan but since moving to SF Ghiradelli has really won me over! omg I want an Influenster box. how do I get that?!?!?! 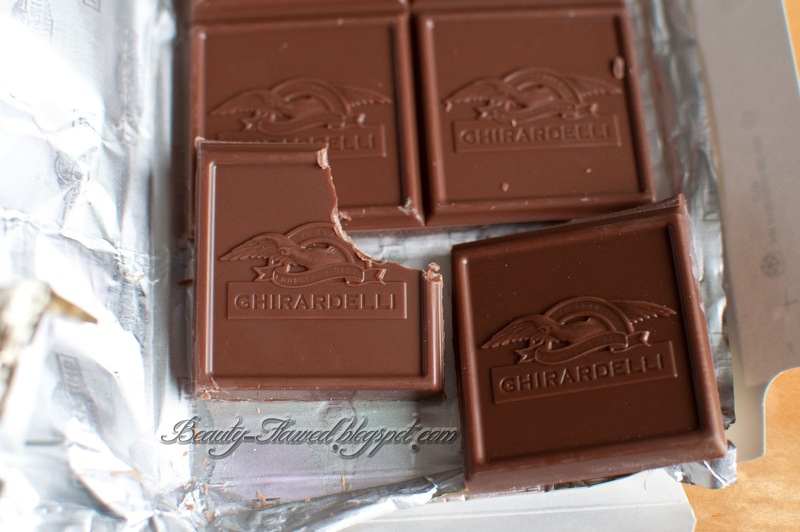 I totally love Ghirardelli and my fave, like Bessie's, is the caramel one! 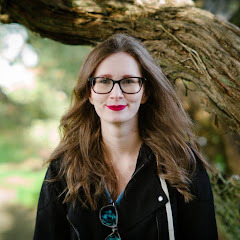 Go to Influenster's website and sign up (it's FREE), then unlock some badges like the blogger badge for example and then unlock any others that pertain to you like the foodie, beauty, that sort of thing. Once you unlock badges and check the site you could be in the running for the next box they make not sure when that will happen I think they do 4 a year. Testing chocolate.. hmmmm.. that is something I can definitely sign up for!